Depending on where you live, perhaps your garden is producing tons of veggies right about now. This morning when I saw about 12 zucchinis on my counter, I knew I needed a plan. My older daughter immediately requested zucchini bread, but I knew that I would have to come up with something a little more healthy to balance out that request! Zucchini bread later… for now here is a very simple marinade. 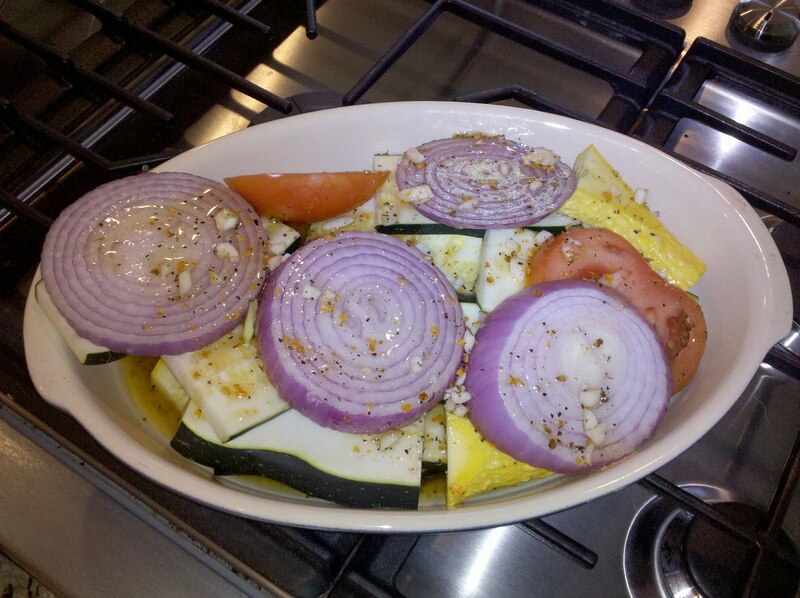 Slice your veggies about 1/4 inch to 1/2 inch thin – we used summer squash, zucchini, tomatoes, and red onion. Everything but the red onion came from our garden! Pour the marinade over the veggies. Cover with plastic wrap and let them sit for about an hour or two (or more). Turn the veggies over so that both sides are evenly coated. Cook them on the grill – we grilled some of the pieces directly on the grill and others on a slotted stainless steel tray. Cook them for about 7 minutes each side – or until they are cooked to your liking. Enjoy!